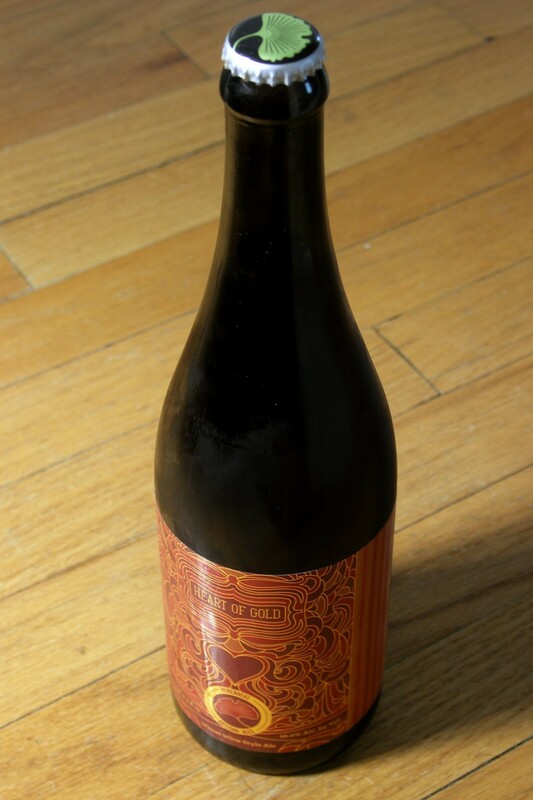 Saint Louis brewery Perennial was founded in September 2011 by former Chicagoan Phil Wymore, who'd previously managed the barrel program at Goose Island and then served as head brewer at Half Acre for a spell. His wife, Emily, and her father, Russ Bryant, help run the business, and on the brewing side Wymore has taken on Cory King, who used to manage the International Tap House in the Soulard neighborhood of Saint Louis. Perennial got my attention this summer with Fantastic Voyage (a strong milk stout made with coconut) and an excellent peach Berliner weisse. So in late October I picked up a bottle of the Heart of Gold wheat wine when the 2012 batch (the second overall and first with this label) hit stores. Heart of Gold won a silver medal in "Other Strong Beer" at last month's Great American Beer Festival in Denver. There were 55 entries in that category, one of 84 at the festival; the gold went to Boulevard's Reverb Imperial Pilsner, in a good showing for Missouri. Wheat wine is a newish style, having arisen in America (probably California) at some point in the past three or four decades. (Home brewers are almost certainly responsible, which makes it difficult to be precise.) 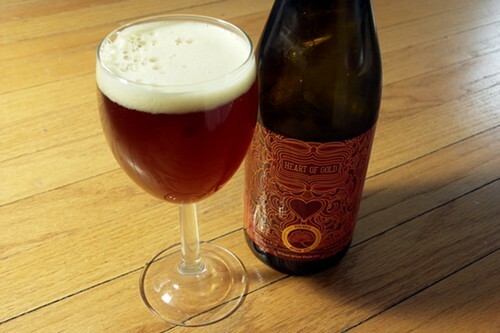 It's about as strong as the comparatively ancient barleywine style—Heart of Gold is 10 percent alcohol, at the low end of the typical range—but wheat malt accounts for more than half of its grain bill. Heart of Gold is a hazy, ruddy amber, with a modest fluffy head that clings to the glass. Even after an hour the foam doesn't entirely dissipate, since strings of bubbles rise from below to replenish it—it's a bit like what happens with champagne, except the bubbles are much smaller and I don't have a terrible headache now. Given that Heart of Gold smells so much like desserty breakfast foods, its taste is a little startling—I'd expected it to be much sweeter. The beer's velvety mouthfeel is offset by a tart, dry prickliness on the tongue from the vigorous carbonation. The wheat malt gives the flavor a gentle grain floor and a hard-to-pin-down but ever-present candylike note, like a ribbon of caramel that gets into everything. The yeast and hop flavors are prominent too: I get a restrained fruitiness like baked cherry, apple, and plum, a touch of deep funky sourness, and a clean but intense herbal bitterness in the finish. The beer's subtle but perceptible alcohol bite, in combination with its caramel malts, could persuade you there's some whiskey in it—in fact its combination of booziness, maltiness, fruitiness, and bitterness is ever so slightly like a Manhattan. It's part of Perennial's cellar series, and I could see it aging very well. For the metal portion of this "Beer and Metal" post—a conceit that's beginning to look increasingly ill-advised—I tried to come up with a band or song that sounds like Heart of Gold tastes, like I did with Pipeworks' Abduction stout. But I'm stymied on this one. Maybe wheat wines just aren't all that metal. I thought the name "Heart of Gold" might have something to do with the Neil Young song, or with the stolen starship powered by the Infinite Improbability Drive in The Hitchhiker's Guide to the Galaxy, but I don't have any evidence for either assumption. At any rate, here are three active metal bands from Saint Louis, all of them worth a listen. The Lion's Daughter play blackened death doom, in the parlance of the genre; Rites of Impiety play, um, "Christraping black death" (in their own words); and Fister play sludgy doom (as you'd probably gather from their slogan, "If it's too slow, you're too young").